Have you given any thought to how you want your tables setup at your reception venue? What about your seating plan? Have you figured out if Aunt Sally will be sitting next to cranky Uncle Ted? Have you decided on what type of receiving line will work for you? Often, couples don't take the time out to really give these factors the warranted consideration they require. An experienced and capable Wedding and Event Planner would normally help you to design the perfect room layout for your reception. However, in this segment we are going to give you helpful tips and ideas on how you too can achieve the perfectly designed room layout without any problems. Table shapes vary from venue to venue. The table shape your venue uses will dictate how they can be laid out and best arranged to make the space look balanced for the number of guests to be seated. The most popular shape used are round tables. Typically, most reception table layouts consist of a long, rectangular top table for the bridal party and several round tables spread out throughout the room for guests. You might want all the tables to be the same size and shape or you might want to vary them. 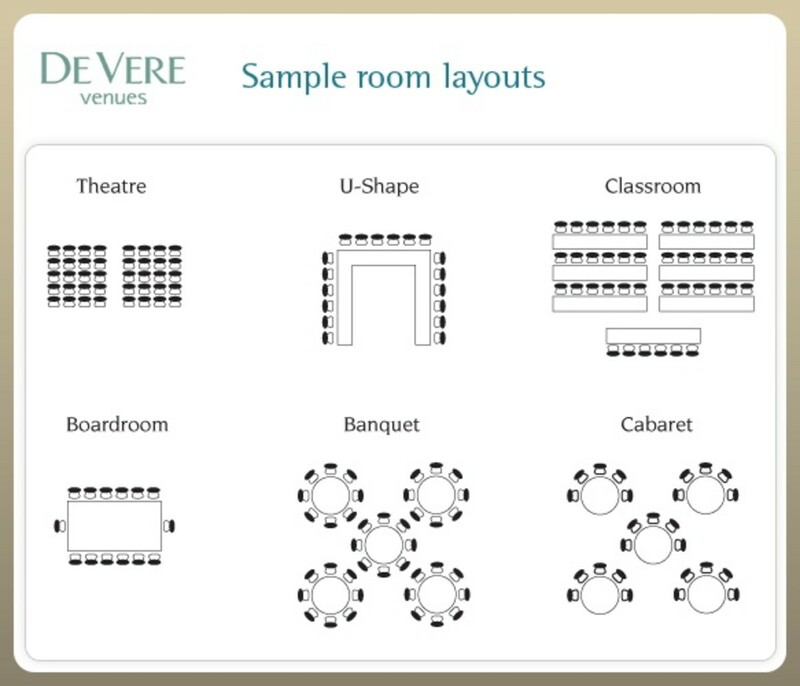 Find out what table sizes and shapes are available at your venue. The figures below give you a rough idea of the venue size required, for your number of guests and the type of seating you desire. Bear in mind that these figures don't allow for dance floors and other unused space. For example, a room that is 10m x 10m = 100 sq m will hold a maximum of approximately: 200 standing guests, 140 guests at rectangular tables, and 100 guests at circular tables. You should ensure that the tables are placed where serving staff will have easy access. Don't block fire exits or doorways! If your venue accommodates more guests than the number you have, you can put all the tables in one area to ensure that the space will not feel too empty. This is based on 1.9 ft and 1.6 ft circumference per guest for ideal and maximum space respectively. Bear in mind that if you have guests using wheelchairs or walkers, you may need additional space. 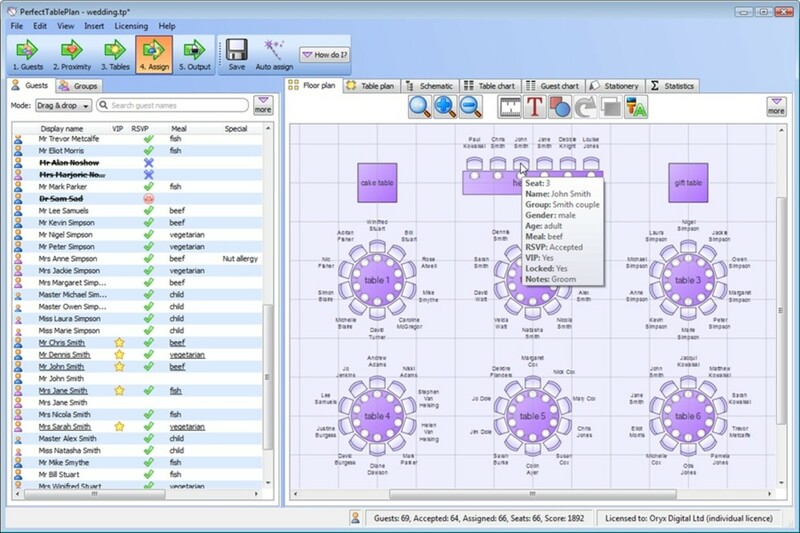 If you want to ensure that you design the perfect room layout with regards to table and seating arrangements, you may want to consider using software specifically designed to eliminate the guesswork. Below is an example of the awesome things you can do with room layout software such as this one offered by Perfect Table Plan - (www.perfecttableplan.com). It can help to alleviate a lot of the stress associated with figuring out seating arrangements. Also, it will automatically assign guests to seats according to their preferences. What more could you ask for? 1) Although nowadays, some couples are choosing round tables for themselves and their bridal party, this should be avoided. 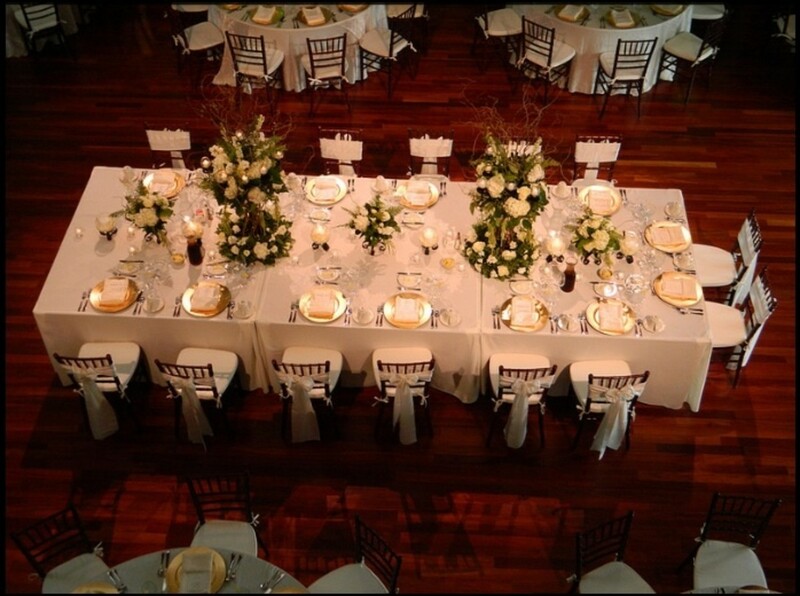 Round tables will obscure the view of the bride and groom as well as other members of the bridal party. You don't want guests looking at your back all night. 2) It is always customary for the immediate family to sit closest to the Head Table. 3) It is also customary for male and female guests to be seated alternately. Also, if you separate couples, be sure to seat them close by to each other. 4) Ensure that little ones are always seated with their parleast or at least one parent..
5) Although it is a good idea to seat guests with familiar faces, sometimes it is just not possible. In this case, it is a good idea to try to at least seat them with guests of the same age groups or with similar interests, i.e. friends, work colleagues, aunts and uncles. Generally, guests will be uncomfortable sitting with people they don't know therefore affecting their overall wedding experience. Unfortunately, when round tables are used, often couples are tempted to fill them with unconnected guests. 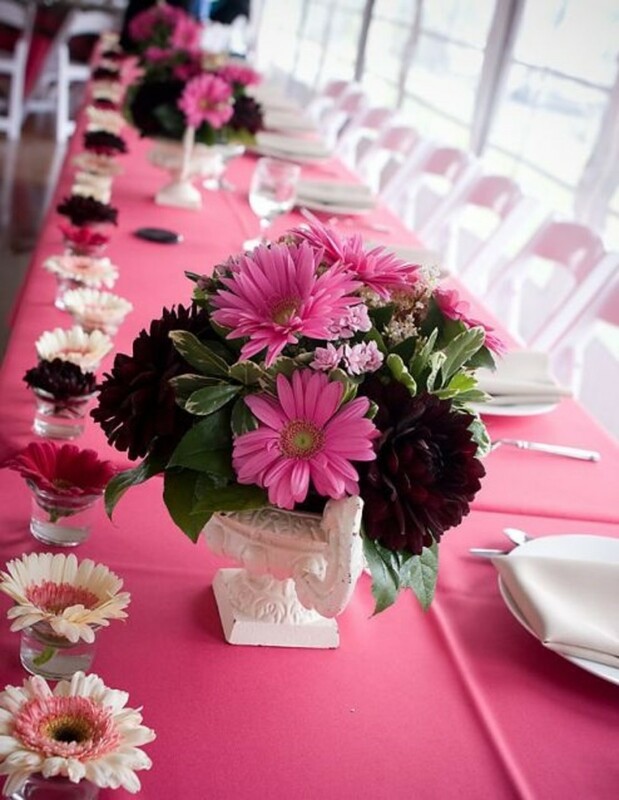 -Well thought out table arrangements will be a pleasurable experience for your guests. -Do your best to avoid "politically incorrect" blunders. Remember, you will not be able to please everyone. -Try your best to incorporate a little flexibility into your seating plan. -Remember to include these other factors into your floor plan: DJ Location, Cake Table, Microphone and Podium, Gift Table, and Place Card Location. If you are still not sure, talk to the manager at your reception venue. Through experience, they should be able to steer you in the right direction with your table layout. In our segment on Etiquette we already touched a bit on the "proper" way to seat your guests. We are now going to dig a little deeper and find out what sort of solutions are available for the often problematic seating arrangement plan. Seating is probably one of the most difficult tasks you will undertake during the wedding planning process. You will be pulling your hair figuring out who sits where. We tend to put it off as long as possible but you will have to deal with it sooner rather than later. Once again, your seating plan, much like the table layouts will depend on the table shapes. For example, if your venue has rectangular tables, couples are to be seated across from each other. If they are seated at round tables, they should be seated next to each other. Weddings with 100 guests or more can prove complicated when sitting for dinner. In order to avoid this, it is common to provide guests with printed table plans and place cards. Printed table plans should be displayed at the entrance to the reception hall or dining area. For easy reference, the guest's names should appear alphabetically with their table numbers printed next to their name. Using this method will allow guests to find their table quickly. The table place cards should be placed on top of the coordinating table by their seat. 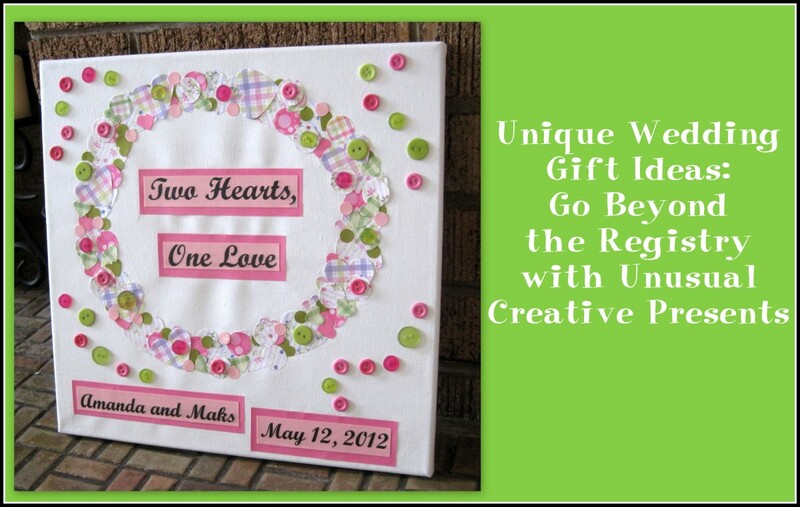 Many couples choose to give the place cards to guests as they arrive, along with a favor. Ensure that each table number is clearly visible in the reception room. -Try to seat members of the bride and groom’s families at tables together. If both families get along, this is a wonderful time to get to know each other a little better. -It is appropriate to alternate your female and male guests. -Ensure that couples are seated beside one another, but if space is limited, they should at least be seated at the same table. 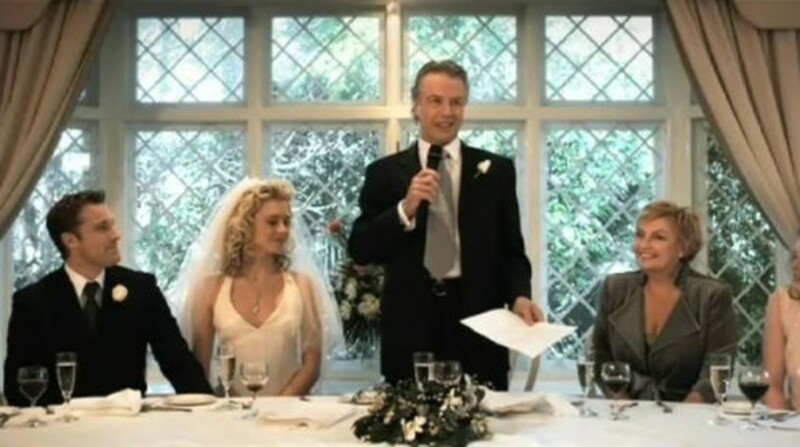 -Place anyone delivering speeches where guests can see them. Also, they should never have their backs to the guests. -It is a good idea to place any guests with special needs as well as expectant mothers, seniors and guests with children near easily accessible facilities including washrooms. -Elderly guests may have a harder time hearing and seeing from a distance. Be considerate and try your best to seat them where they can see and hear any speeches. Also, don't seat them near the band or DJ. That probably will not go over very well. -inform the venue manager or caterer if high chairs or booster seats are required for children. 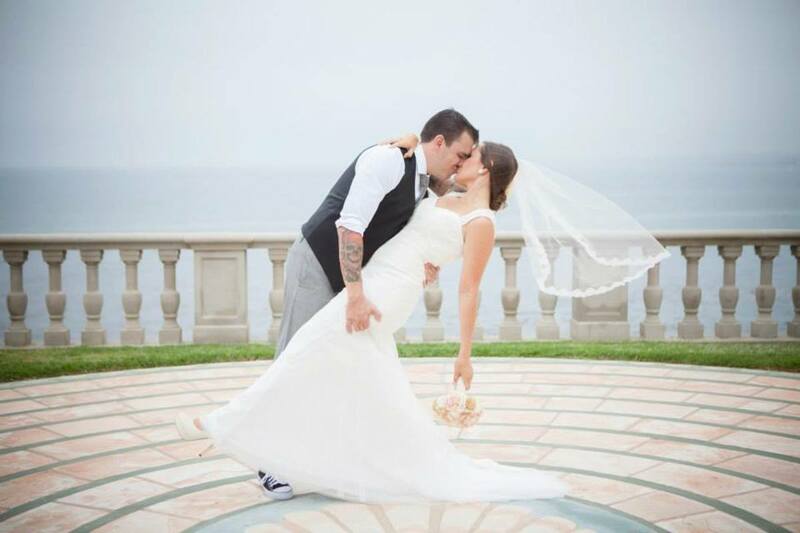 -Do not make your wedding a place for matchmaking your single family members or friends. Figure out where they would be most comfortably seated. Also, it is never a good idea to create a table exclusively for single guests"
-If possible, and you intend on mixing up tables, ensure that enough confident, talkative people are placed at each table and distributed around the tables to encourage conversation. -At all costs, don't create a table at the back of the room full of people that you feel didn't belong with the other grouping of tables. These guests will be made to feel like the "party leftovers". -Although times are changing, traditionally the bridal party is seated at the front of the room, at a long table, facing the guests. -The bride, groom and attendants should never be seated at tables where their backs are facing the guests. -The cake should be displayed on a small table to one side of the bridal party. This is done so that the photographer and guests can take photos and so the bride and groom can cut the cake facing the guests. -If you have a number of vendors you intend to feed, e.g. photographer,videographer etc., you may want to assign them to a separate table. -Family and close friends are to be seated closest to the bridal party's table. 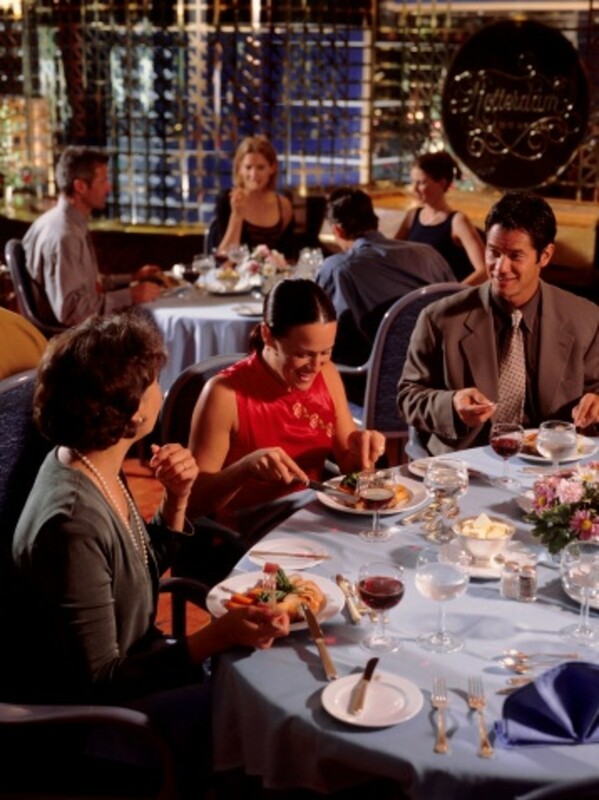 -Distant family members and friends can be seated at tables that are further away. -Bear in mind that wedding protocol differs between countries and cultures and you will have to make the necessary adjustments in your seating plan to address the varying issues. There are many factors to consider when it comes to your seating plans. As mentioned previously, no matter how hard you try, whatever your decisions may be, you cannot please everyone. The above tips are merely suggestions so don't stress out. If you seat people where you think they will be most comfortable, then you have done your job. It will be up to your guests to have a good time. Typically, the bridal party is seated at a long, rectangular table with chairs down the same side. Generally, this is referred to as a ‘top table’ or ‘head table’. Sometimes, parents are placed at this table as well besides the bride, groom and attendants. However, if the couple's parents are divorced or remarried, this may become a problem. It is best to resolve any potential issues beforehand. It is a better idea to seat them at separate tables. -The groom sits to the right of the bride. 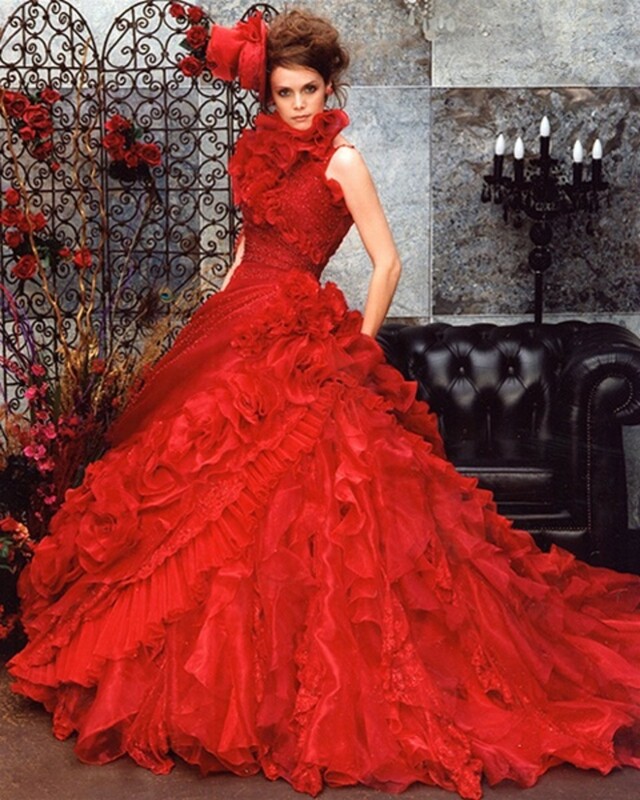 -Alternate bridesmaids and groomsmen so it is male-female. -Partners of the best man and maid of honour should be seated at other tables. -If it is a second marriage seating children from the previous marriage at the head table is acceptable. -Don't worry about certain guests being left out of the head table seating. This problem can be remedied by asking them to “host” one of the guest tables. It will give them a sense of involvement. Ensure that all guest table hosts are clearly indicated on the seating chart. -The parents of the bride and groom are seated at the tables nearest to the head table, (unless they are in the bridal party). -It is fast becoming popular for the bride and groom to sit alone at their own table, or “sweetheart table”. This choice works well if you wish to avoid any issues about who should be seated at the head table. -Some couples choose not to have a head table. Instead, they can leave a couple of empty seats at each guest table so they can visit during the meal. Although this is a quaint idea in principle, it will mean that two guests at every table will have empty seats next to them during the reception. Also, it is not a useful concept when planning your seating arrangement. Once again, these are suggestions and at the end of the day, it is really up to you who you wish to place at your top table. 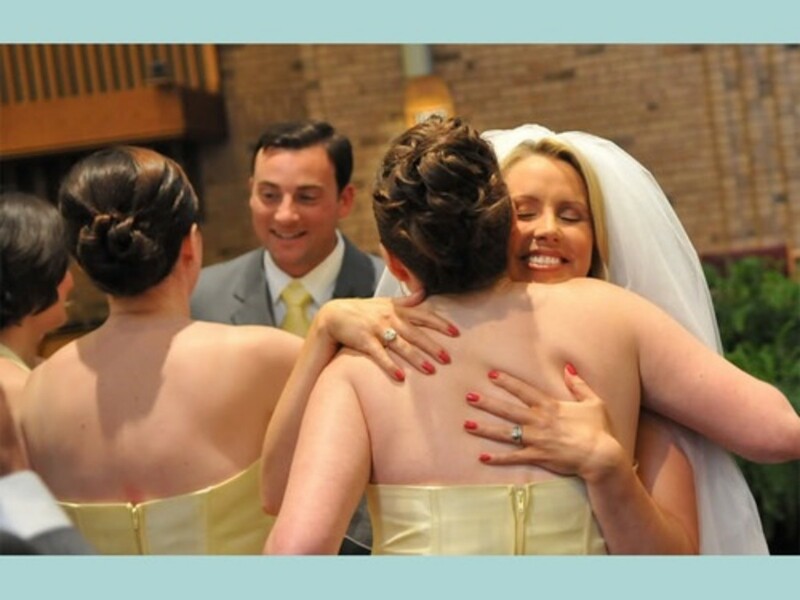 The tradition behind the custom of the receiving line at a formal wedding was in order for the mother of the bride or the hostess to welcome the guests into the reception personally. This was regardless of who paid for the wedding. -A receiving line is a good way to allow the newlyweds to introduce all of their loved ones and friends to one another. 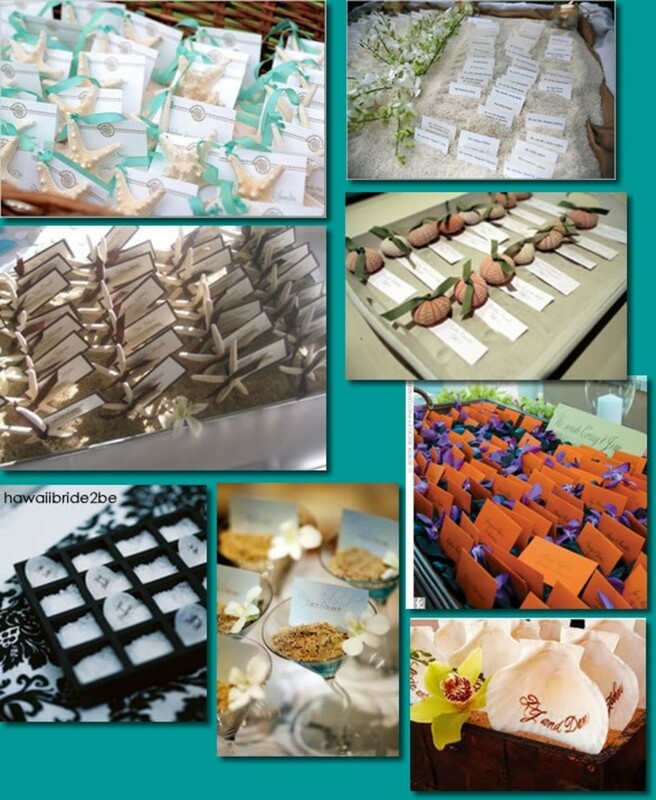 -It is a wonderful way to thank your guests individually for attending your wedding. -It may be the only time some of your guests get to speak to you and your parents during your reception especially if it is a large affair. -Another benefit of having a receiving line is to extend a special thank you to all your guests from out-of-town. -A receiving line will allow the bride, groom and guests to really enjoy the reception without having to worry about going from table to table thanking guests all night long. 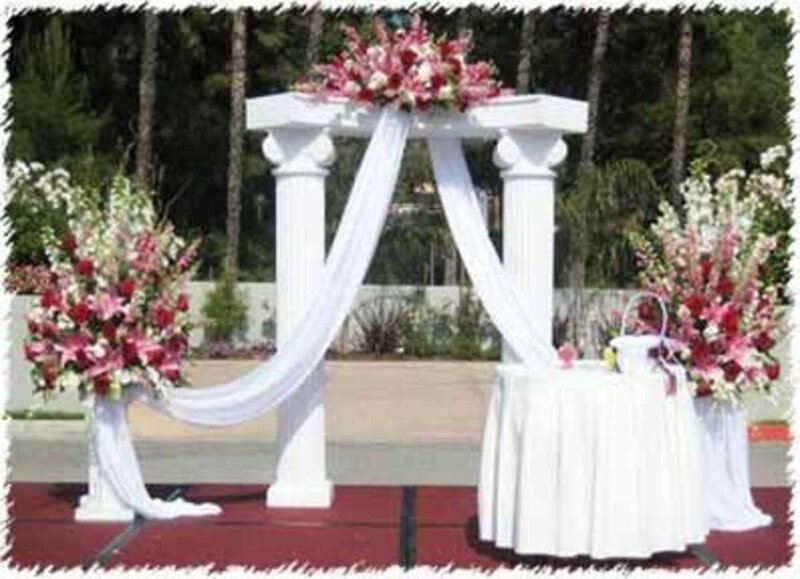 -Ensure that the venue will have the facilities or space for a receiving line. Also, make certain that it will be located where your guests will have plenty of room and not feel crowded. -Your attendants do not need to be in the receiving line. They could be assigned the duties of ensuring that your guests know where they are going and that all else is running smoothly. Knowing that they will be looked after will alleviate the stress of worrying about those guests that have already made their way through the line. -If your wedding is smaller and there are no time constraints, you could have a receiving line following the ceremony as your guests are leaving. -Generally, divorced parents should not stand next to each other if they are remarried. 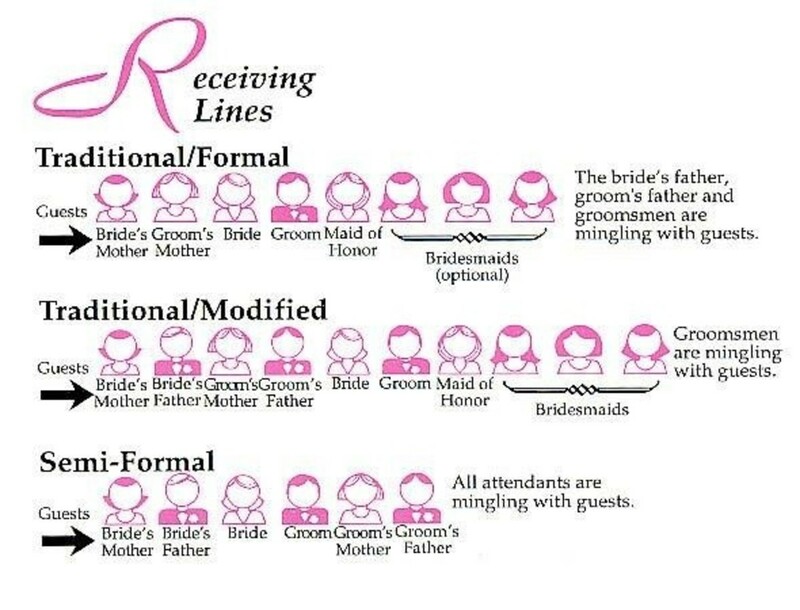 However, you can choose to have the mothers only in the line or you can separate each parent by placing a bridesmaid or the maid of honour between them. There are many ways you can deal with divorced parents. At the end of the day, most couples will know what will work best for their own parents or step parents. Let common sense prevail. -Try to keep the greetings with your guests to a minimum. Remember, you will always have certain relatives that will want to carry on a conversation with you while displaying no signs of wanting to move along. You don't want the rest of the guests waiting in line for long periods of time. -The bride and the mother of the bride are the first in line, therefore, they are responsible for introducing their relatives and friends to the groom and his mother. On the flip side, when the groom's relatives and friends pass through, they should introduce themselves to the bride and her mother. -It is a good idea to determine how much time, approximately, it will take for each guest to go through the line and pass on their best wishes. 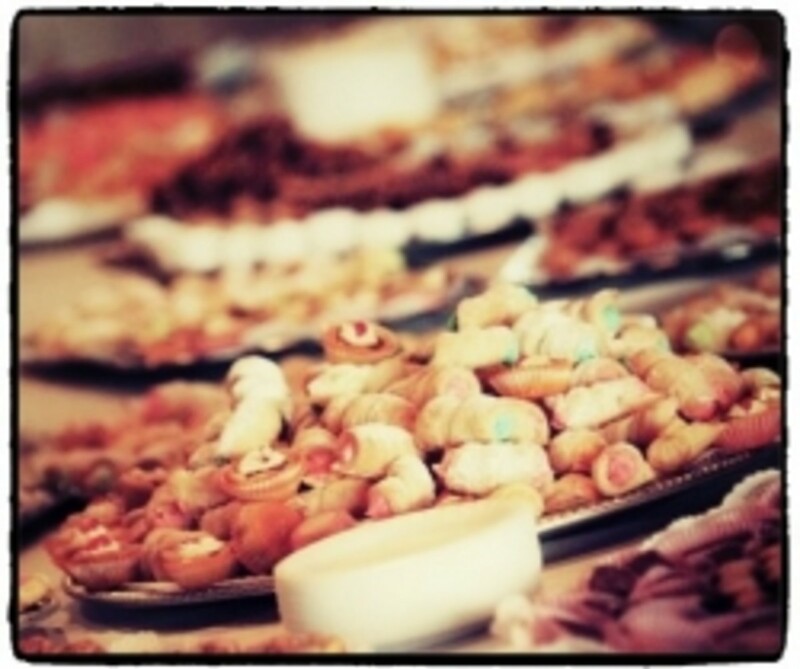 As an example, if you are having between 150 to 200 guests, you should allow a minimum of 40 minutes to an hour. Find out from your venue, (if it is a sit down meal), what time they expect guests to be seated. You will have to take this into account and adjust accordingly. 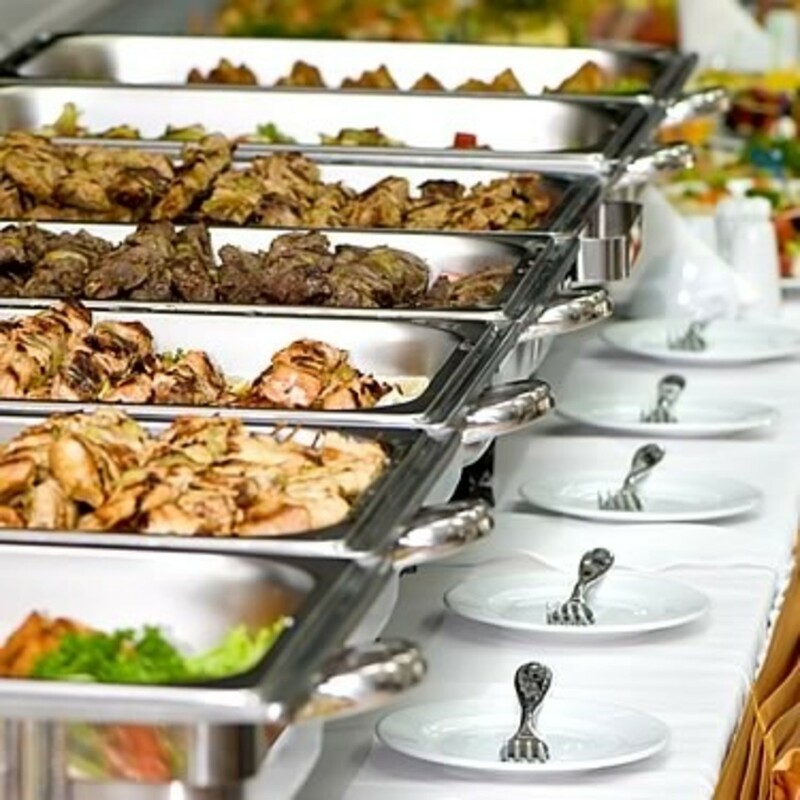 -You may want to consider having your venue serve drinks and/or hors d'oeuvres once your guests have gone through the receiving line. 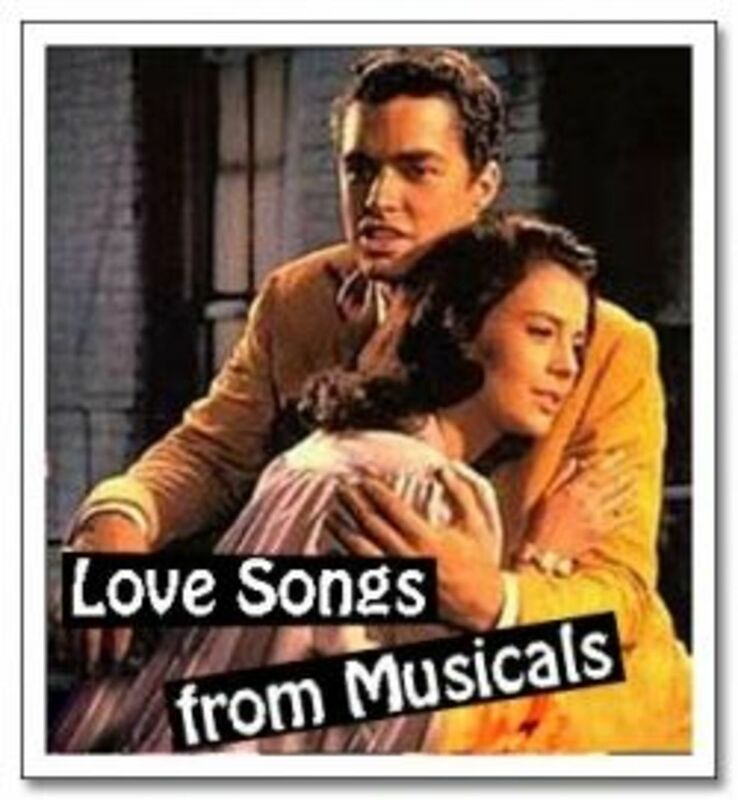 It is also a good idea to ensure that soft music is playing in the background while your guests are mingling. It will help to enhance the ambiance. Hopefully this segment on designing your reception room layout was helpful. It is an aspect of a wedding plan that often does not receive enough consideration. As you can see, the thought you put into your table layout, seating plan and receiving line plays an integral role in the success of your reception. So, take the time to work it all out and your wedding reception is guaranteed to be an affair to remember. Do you think wedding reception receiving lines are important?